KARACHI: Orangi is a maze, a spider’s web of narrow, winding lanes, broken roads and endless rows of small concrete houses. More than two million people are crammed into what is one of the world’s largest unplanned settlements here in western Karachi, Pakistan’s largest city. But Orangi has a problem: it has run out of water. It is so rare for water to flow through the taps here that residents say they have given up expecting it. The last time it flowed through the main pipeline in Begum’s neighbourhood, for example, was 33 days ago. Instead, they are forced to obtain most of their water through drilled motor-operated wells (known as ‘bores’). Ground water in the coastal city, however, tends to be salty, and unfit for human consumption. “When we shower, our hair [becomes] sticky [with the salt], our heads feel heavy,” says Begum. The only other option for residents is to buy unfiltered water from private water tanker operators, who fill up at a network of legal and illegal water hydrants across the city. A 1,000-gallon water tanker normally costs between $12 and $18. Begum says she has to order at least four tankers a month to meet the basic needs of her household of 10 people. But not everyone in this working class neighbourhood can afford to buy water from the tankers or to pay the approximately $800 its costs to install a drilled well for non-drinking water. Asked how she gets by, with so little water coming via the taps and no access to a saltwater source to clean dishes or laundry, she seems resigned. When she washes her clothes, she says, she makes sure not to leave the tap on. She’ll fill a basin with water and wash her dishes in that, rather than under running water. She waits until there is at least a fortnight’s worth of dirty clothes before beginning to wash them. Every drop of water, she says, needs to be accounted for. But despite all this rationing, the water tank at her home is almost dry. Orangi’s problems, while acute, are not unique in Pakistan’s largest city. Karachi’s roughly 20 million residents regularly face water shortages, with working class neighbourhoods the worst hit by a failing distribution and supply system. Areas such as Orangi, Baldia and Gadap, some of the most densely populated in the city, receive less than 40 per cent of the water allotted to them, according to data collected by the Orangi Pilot Project (OPP), an NGO that works on civic infrastructure and citizens’ rights in the area. On average, residents in these areas use about 67.76 litres of water per day, according to data collected by Al Jazeera. That includes the water they use for drinking, cooking, cleaning, washing clothes, bathing and sanitary uses. So what is going on here? How is it possible that in one of the largest cities in the world, there simply isn’t enough water being supplied? Is it because the reservoirs and water sources supplying Karachi just aren’t large enough for this rapidly expanding megacity? The answer to these questions is somewhat surprising. WHERE IS KARACHI’S WATER GOING? Karachi draws its water mainly from the Keenjhar Lake, a man-made reservoir about 150km from the city, which, in turn, gets the water from what’s left of the Indus River after it completes its winding 3,200km journey through Pakistan. Through a network of canals and conduits, 550 million gallons of water a day (MGD) is fed into the city’s main pumping station at Dhabeji. That 550MGD, however, never reaches those who need it. Of that water, a staggering 42 per cent – or 235 MGD – is either lost or stolen before it ever reaches consumers, according to the Karachi Water and Sewerage Board (KWSB), the city’s water utility. Karachi’s daily demand for water should be about 1,100 MGD, based on UN standards for water consumption for the megacity of more than 20 million. 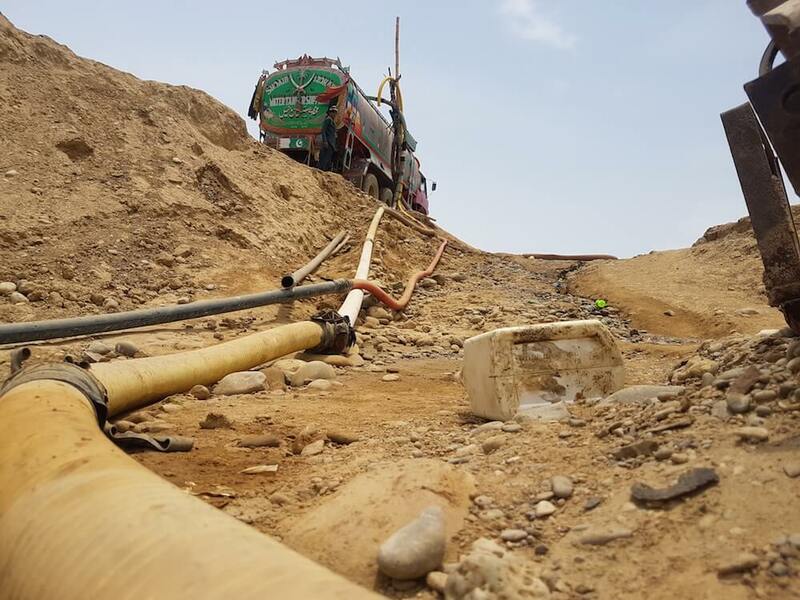 If that estimate – considered generous by local analysts – were to be pared down, however, Karachi’s current water supply should still be adequate to service most of the city’s needs. “If 550GMD of water actually reaches Karachi, then right now, with conditions as they are, we would be able to manage the situation very well and provide water to everyone,” says Ovais Malik, KWSB’s chief engineer, who has been working for the utility for more than 12 years. Malik complains that the water supply infrastructure in the city is aged, parts of it running for more than 40 years, and that the funds simply are not there to fix the problems. KWSB is, by any standard, a sick institution. This fiscal year, it estimates that it will be running at a deficit of 59.3 per cent. Only about 60 per cent of consumers pay their bills, with the biggest defaulters being government institutions themselves, which owe KWSB about $6 million in arrears. Moreover, Karachi has expanded in a largely unplanned fashion over the last several decades, with informal settlements ‘regularised’, but not properly brought under the ambit of civic services, he says. “Our [settled] area has grown too much. Our…system has not been able to bear it,” says Malik. Farhan Anwar, an architect and urban planner, told Al Jazeera that KWSB was almost bankrupt. That lack of capital investment affects not just the ability to provide water, but to make sure that it is clean enough to be consumed, Anwar argues. And KWSB never seems able to get around to addressing these problems, several analysts said. The problem, however, is not just leakages and inefficiency in the system: it is theft. The bulk of Karachi’s ‘lost’ water is being stolen and sold right back to the people it was meant for in the first place. WHO IS STEALING KARACHI’S WATER? Akhtari Begum, 48, has to manage a household of five people on her husband’s income of $160 a month. She ends up spending more than a third of that on water. A typical 1,000-gallon water tanker costs anywhere between $12 and $16, depending on where you are in the city, what time of year it is, and how desperate you might be. Water tankers have been a part of Karachi’s water supply landscape for decades. Initially introduced as a stop-gap measure while the KWSB was meant to be expanding the city’s water supply infrastructure, they have grown to dominate the sector. Today, there are more than 10,000 tankers operating across the city, completing roughly 50,000 trips a day, according to Noman Ahmed, the head of the architecture and urban planning department at Karachi’s NED University. They are meant to fill up at 10 KWSB-operated hydrants, but the business is so lucrative that more than 100 illegal hydrants operate across the city, tapping into the city’s mains to steal water. “There are more than a hundred of them [illegal hydrants], and those are just the ones that have been identified. Every day there’s a new one being made somewhere,” says Anwar Rashid, a director at the Orangi Pilot Project (OPP), which tracks the tankers’ illegal activity. “They’re visible easily. They tap into the bulk mainline. They syphon off the water. And then there are tankers standing there, and they’ll fill up directly from the [illegal hydrant] and then drive off. “When they take from the bulk, then that means that the water that was meant for residential areas will be reduced,” says Rashid. The scale of the theft is staggering. If tankers in Karachi are making 50,000 trips a day, with each trip priced at an average price of Rs3,000 (prices vary between Rs1,200 to Rs7,000), that amounts to an industry that is generating Rs150,000,000 a day. That’s $1.43 million, every day. In a month, that adds up to $42.3 million. By the end of the year, stealing water in Karachi is an industry worth more than half a billion dollars. But the people who are meant to be controlling the theft are the ones cashing in, tanker operators, analysts and former KWSB employees told Al Jazeera. There are periodic drives to shut down these illegal operations. But none last for long. If the very people responsible for shutting down the illegal theft of water are the ones benefitting from it, who will watch the watchmen? “If I fix the water system in an area, then no one will take a tanker. If we fix the system, whatever illegality is happening will [be] finished,” says the current senior KWSB official. For 16 years, Ali Asghar, 75, tended to his small herd of cows and buffalo on a small plot of land behind his cramped four-room house in Orangi. Four years ago, when the water supply to his area began to suffer, he had to give them up. Today, his entire household of 17 people is dependent on water bought from tankers. The biggest injustice, he says, is that he is still paying his bills to KWSB, for water that never comes.